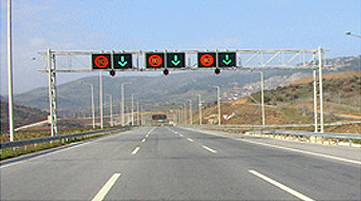 Variable Message Signs (VMS) is one of the most convenient and cutting-edge tools for dynamic traffic control. LED-based, they provide brilliant legibility, are energy-efficient and have an excellent luminance ratio. The unique optical design avoids the problems associated with reflections. Even at low sun position best legibility is guaranteed. Furthermore, their designs are weather-resistant and modern, keeping in mind the importance of aesthetics for a smart city. These are fixed displays used to inform the drivers about directions, road and weather conditions. 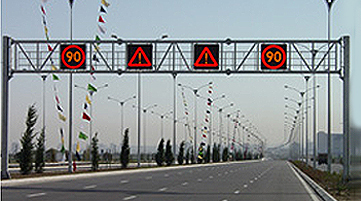 They are in the form of overhead displays on highways or important junctions. These are used to provide parking instructions to the driver with graphic, numerical and cross / arrow displays. The optical systems used here can be read by the drivers even when the sun is low. The signs display the speed of the approaching vehicle and start flashing when the speed exceeds the maximum limit. A VMS specially developed for tunnels or parking areas with low ceiling. It makes use of a unique stair shape housing construction and hence is useful in smaller tunnels too. It attracts the motorist’s attention by its ‘growing’ appearance as the vehicle approaches the sign. A combination of flashers and alpha numerical text sections, these VMS have a combination of 15 different signals for the motorist. It also has LED dot matrix signal displays. These are used on highways or for providing warning at black spots or schools. Dynamic Route Information Panels (DRIPS) are variable signs with modular designs and freely programmable LED matrix. They are used as overhead displays for traffic guidance on highways. These are temporary displays which can be put up wherever information is to be provided. These are mounted on cars or trailers for easy movement and used to inform about weather information and temporary traffic control at different events like road repairs and diversions or to provide parking instructions. M-SPOT or Mobile car displays are mounted on police cars, emergency and service vehicles to protect areas of interventions and divert traffic as and when necessary. 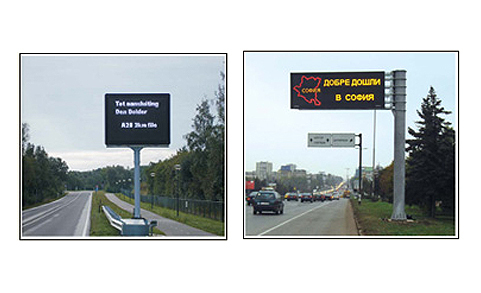 Flexible LED displays that are used to inform about ongoing road work on highways, warn against traffic congestion or inform about re-routing. Trailers and trucks are usually used for these displays. High quality graphic mobile signs that are reliable and easy to handle. Portable, easy to set up and durable in demanding environmental conditions, they use universally understood signs to inform about the traffic situation. Road maintenance vehicles and warning trailers are used to warn about special road conditions, construction works or other changes in the traffic system.